My most common use of gifs for PR purposes is for posting on Twitter, and also for putting straight into emails for media. 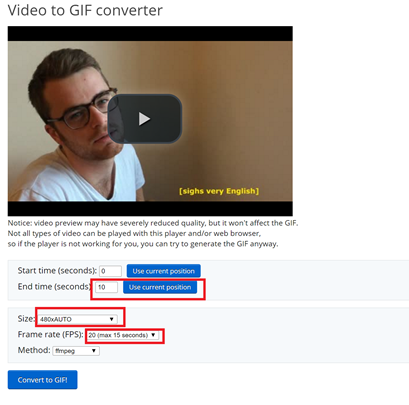 For these approaches you should aim for a gif under 5MB. That’s the maximum size that Twitter will display animated gifs on mobile (15MB for desktop), and it’s not so big in emails that it will take ages to load – time in which you could lose your audience already. 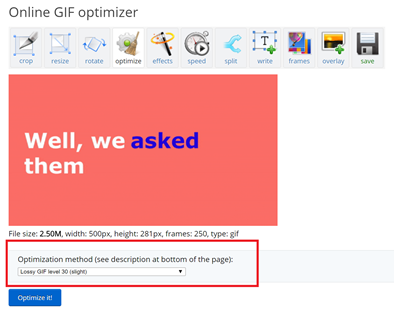 If your gif looks nice at this point and is under 5MB (or a bigger file size you prefer if don’t need it for Twitter mobile or emails) you are DONE!